﻿ Psalm 22:3 You are holy; you sit as king receiving the praises of Israel. But thou are holy, O thou who inhabit the praises of Israel. But You are holy, O You Who dwell in [the holy place where] the praises of Israel [are offered]. But you are holy, O you who are seated among the praises of Israel. But thou art holy, O thou that inhabitest in the midst of the praises of Israel. And thou inhabiting the holy place, the praises of Israel. 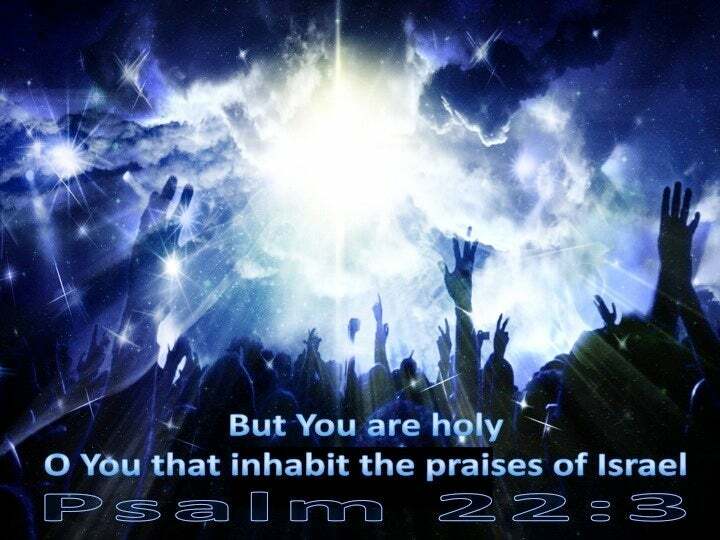 But you are holy, O you that inhabit the praises of Israel. Yet you [are] holy, enthroned on the praises of Israel. And thou continuest holy, O thou worship of Israel. But, thou, art holy, Who inhabitest the praises of Israel. And Thou art holy, Sitting -- the Praise of Israel. 2 My God, I cry out during the day, but you do not answer, and during the night my prayers do not let up. 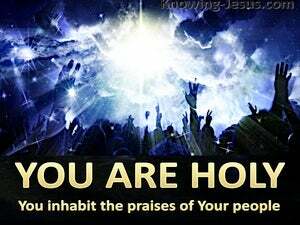 3 You are holy; you sit as king receiving the praises of Israel. 4 In you our ancestors trusted; they trusted in you and you rescued them. He is the one you should praise; he is your God, the one who has done these great and awesome things for you that you have seen. For the music director; a psalm of David, a song. Praise awaits you, O God, in Zion. Vows made to you are fulfilled. Whoever presents a thank-offering honors me. To whoever obeys my commands, I will reveal my power to deliver." Praise the Lord our God! Worship on his holy hill, for the Lord our God is holy! The Lord is just in all his actions, and exhibits love in all he does. They called out to one another, "Holy, holy, holy is the Lord who commands armies! His majestic splendor fills the entire earth!" Each one of the four living creatures had six wings and was full of eyes all around and inside. They never rest day or night, saying: "Holy Holy Holy is the Lord God, the All-Powerful, Who was and who is, and who is still to come!"